日本，冲绳县，婚礼圣地建筑群 / General Design - ArchGo! 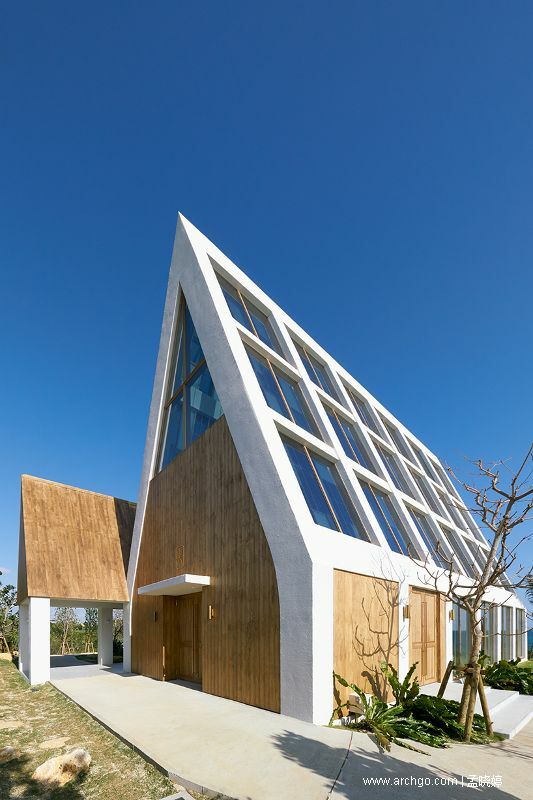 general design has designed a wedding complex on japan’s main okinawa island in the quaint beach village of ginoza to embraces the peaceful harmony of the neighboring seaside town. 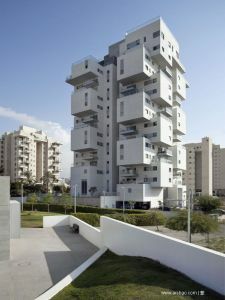 the design enhances the natural serenity of the site in a three-part building complex and its surrounding gardens. 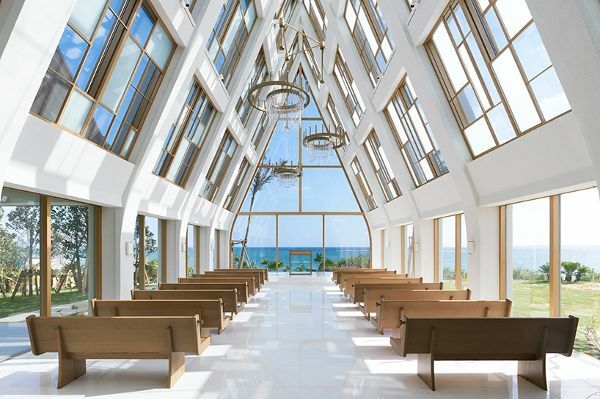 the three-part wedding resort includes a chapel hall, banquet hall, and beach pavilion. secluded from neighboring developments, general design’s structures and plan for the site create an all encompassing experience in which the architecture is integrated into the natural landscape. new trees were planted prior to construction to reinvigorate the existing vegetation. 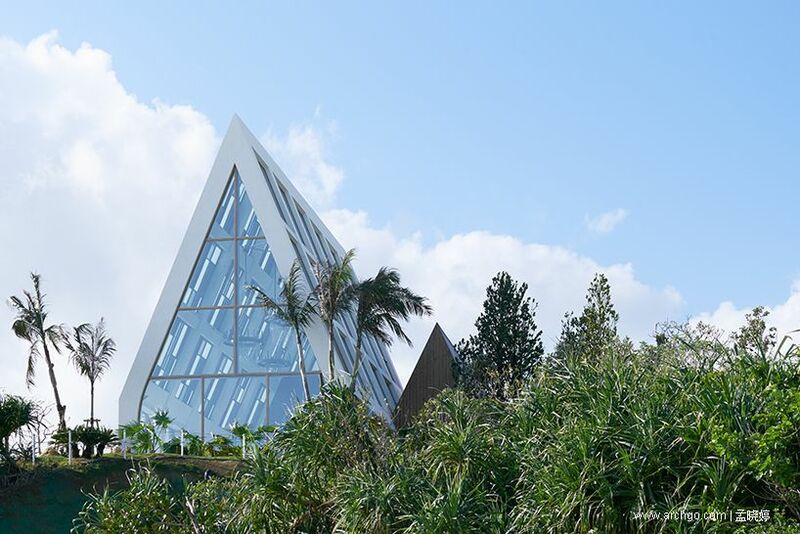 the chapel is located on the highest elevation on the far side of the site, furthest away from the resort entrance to enhance the feeling of an oasis. made of reinforced concrete and glass, the structure’s point roof consist mainly of large skylights, each backed with a grid of aqua-colored glass arranged randomly to defuse the natural light that streams into the interior from every direction. the structure’s use of natural light creates a dramatic presentation as the day passes and light and weather conditions change. guests are led from the chapel to the banquet hall, which maintains the breathtaking views of the pacific ocean. the multi-functional space has a similar light and airy feel to the chapel. the 4 to 5 meter high ceiling allow for generous amounts of natural light and air to circulate throughout the interior. in the entrance hall, the floor level follows the natural slope of the site with a 1500 millimeter difference across the space from the entrance side to the ocean side. a floor to ceiling window wall creates an easy transition between the beach and interior spaces.